In March 1997 several months after Rev. Master Jiyu died I had the opportunity to spend some time alone on retreat in the mountains of Northern California. It was actually the very same place I was staying at this past June. Several monks were at the gates of Shasta Abbey to see me off. 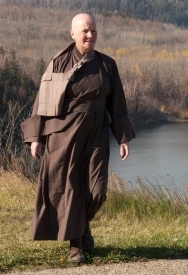 The last monk to say good by said quietly through the open car window, Sit so you don’t know you are sitting. I’d now call that seamless sitting. Easy to say but not so easy to explain what that actually means in practice. But perhaps Zen Master Dogen puts it best, To live by Zen (meditation) is the same as to live an ordinary daily life. He also says that Pure Zazen (seated meditation) must not be neglected. Perhaps the difficulty is making that leap from sitting formally to getting on with ones day – while sitting! That’s to relinquish the idea that meditation is a seperate activity. In the formal sense it is, in the everyday sense it isn’t. The one doesn’t stand against the other. But it looks that way. Thanks to the person who asked what I meant by seamless sitting. I’ll no doubt be thinking on this subject from time to time since it points to the very heart of what the Buddha taught. Sunyata. Previous PostOut And About In The Lake DistrictNext PostOk With Being….. There only is the meditation. This came to me a few months ago while I was unwell. Yes Norman. Sometimes it takes extremity to point one back to what one already knows – and already are.